What will you do with all those fantastic photos that you took at the pumpkin patch field trip and the Halloween parade? What about that great shot you took of your favorite soccer player scoring that last minute goal. Then there's your daughter and her friends dressed to the nines for their Homecoming Dance. Yes the fall season provides wonderful memories in your family’s life. This is the perfect time to use PosterMyWall's Collage Maker. You can take all those photos which you've already uploaded to your Facebook account and make an Insta-Collage in minutes. It'll save you time from having to layout each photo. Just select the photos and the Collage Maker does it for you. But if you really want be creative our Poster Maker is loaded with all sorts of tools and features to make your poster exactly the way you want it. Take the tour now to see how easy it is to create your poster collage! 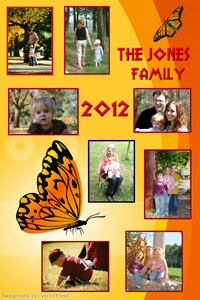 It will make a great family memento or perfect gift! Sep 21 Ideas For Your Halloween Party - Halloween Posters!